The solution is very easy to open IMG or ISO file under Windows! PS: Last tested with 16.04, with older versions it may not work! And you can just also for example easily rename the IMG! 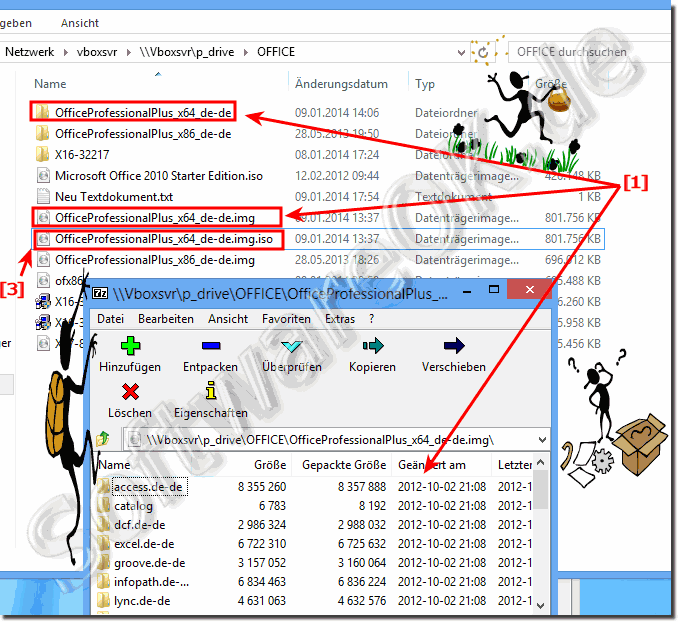 The file OfficeProfessionalPlus_x64_de-de.img to OfficeProfessionalPlus_x64_de-de.img.iso without much expertise. It has always worked for me as well. This is especially useful if the corresponding file can only be mounted as an ISO image. Under Windows 8, 8.1, 10 you can provide the *.img files without additional software by right-clicking on the corresponding file and selecting the option Mount. Afterwards it appears as a normal DVD / CD medium in the MS-Explorer, or in the file manager Quad-Directory Explorer! Otherwise on older Windows OS, please file free and use the Freeware MagicDisc to mount the .img, or to use it for example as a virtual drive! (IMG-1) The IMG File Open and deploy file or mount it! Providing (mounting) * .img files under Windows 8.1 and 8 is really no problem! (IMG-2) IMG files under Windows 8.1 a. 8 open, deploy, mount!